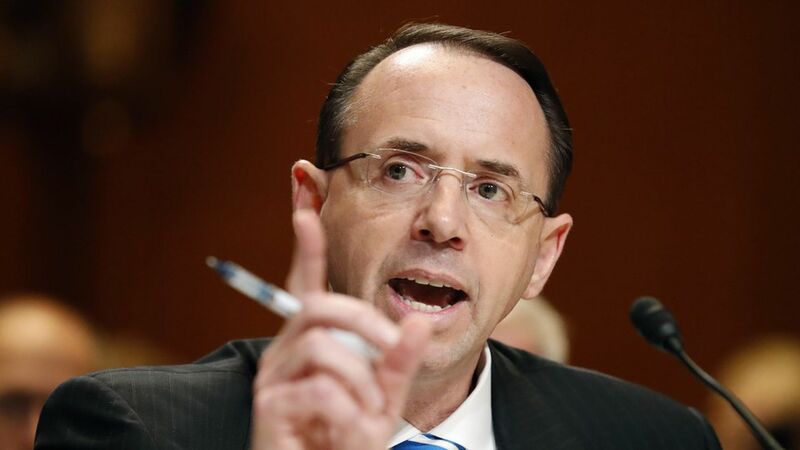 Deputy AG Rod Rosenstein told senators Tuesday that Special Counsel Robert Mueller has "full independence" to investigate the ongoing Russia probe, although he can be fired at any time. Rosenstein said there was "no basis" for firing Mueller, and he would only dismiss him if there was "good cause" — even if Trump ordered him to do so. Rosenstein later confirmed he is the only person who could fire Mueller, but noted there was "no secret plan" to remove him, or at least, "no secret plan that involves me." The quote: "I appointed him. I stand by that decision... I am going to defend the integrity of that investigation." If you were fired, who would appoint your replacement? "The president," said Rosenstein. He later clarified that he could be fired "without cause" at any time, essentially confirming that there is a higher bar to fire the special prosecutor than the deputy attorney general. Why are you answering the panel's questions instead of Sessions? Rosenstein said he knows what is going on in the Russia investigation, whereas Sessions, who has been recused from the probe, does not. "Nothing gets to the attorney general about the matters he's recused from unless they come through my office." Was it appropriate for Sessions to recommend James Comey's firing given his recusal? Rosenstein said he wouldn't comment. Do you have a time estimate for the Russia investigation? "I regret that I do not," said Rosenstein, but said he understands it needs to be done "expeditiously."